The long list of spring workshops is now posted and open for registration! In addition, the Sewing Seeds program at TAC is now accepting applications to its summer residency. 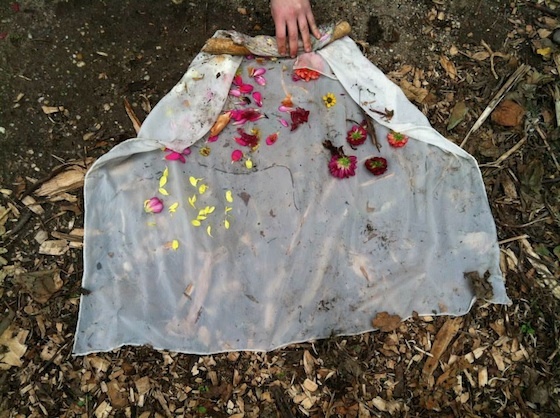 The residency is a fantastic 6-week opportunity to access local natural dyes, use the studio, and engage the community by creating site-specific work in the natural dye garden in Bushwick. What could be better? Yes, I know it's midsummer and I haven't written a thing about what I've been dyeing. My latest dyeing mania is a somewhat lengthier process than usual - but it's Amazing. Fermentation Dyeing. 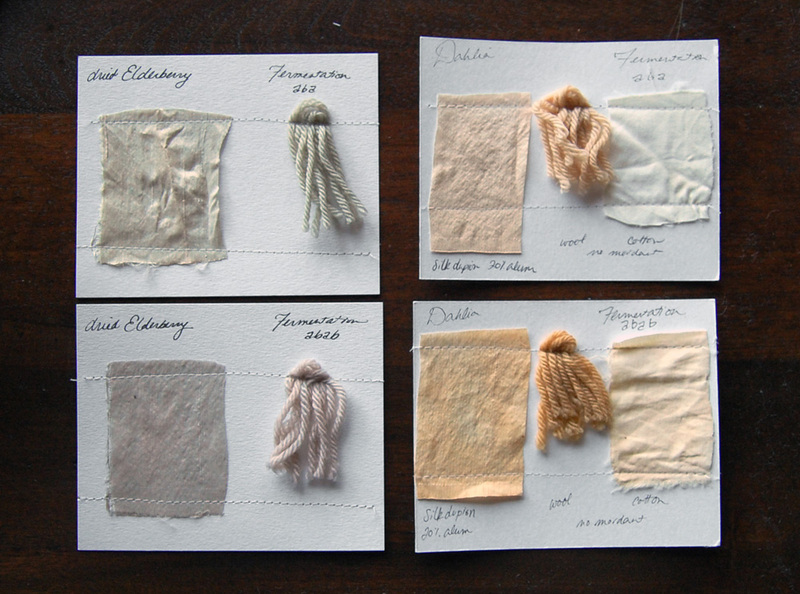 There is not as much information as I'd wish about plant fermentation dyeing, but from what I gather the method was salvaged from history by Anne Rieger in the south of France. The process begins by fermenting plant matter in water for a week or more, releasing the gas and stirring the contents daily. After straining, the dye is separated into two vats. Lemon juice is used to lower the pH of one vat to 4, while wood ash water raises the pH of the other to 11. Protein fibers are steeped in the acidic bath, dried out of the sun, and then submerged in the basic bath. And just like that, you have lightfast color with no heat and no mordants. The colors are beautiful, and the wool samples I've dyed have the most wonderfully soft hand. Cellulose fibers also seem to take the color when given a longer steeping period, but not as strongly. Some inspiration can be found at Riihivilla and Shades of Lynx, and check out the samples I've been working up below. This Sunday you can find me at Brooklyn Flea with a stack of new marbled scarves and ribbons! I'll be with the lovely ladies of Haptic Lab. I love dyeing with bark - it often holds a lot of color, it reacts well to modifiers, and it does not require a mordant. Tree barks have a higher degree of substantivity than leaves or flowers, which means the colorant in bark naturally bonds with cellulose fibers at a molecular level without the help of a mordant (though a mordant can improve color up-take and lightfastness over time). Many plants that are high in tannic acid or oxalic acid are substansive dyes - there is a great explanation over here. Because I most often dye linen and paper, I have come to appreciate the affinity between bark and cellulose fibers. Bark should never be stripped from the trunk of a live tree, it causes too much harm to the tree. However, twigs can be cut from live trees following the rule of taking one-tenth or less, spread over a large area of the plant. To expose the dye-rich inner bark, the twigs can be shaved down using a paring knife. This always seems to me about as fun as peeling asparagus, so when I use twigs I simply chop them into small pieces using garden shears. It is an easy matter to gather twigs or branches from cultivated plants at pruning time. Apple, plum, pear, cherry, apricot, and elderberry barks all give beautiful colors. If you have orchard trees or a friendly local orchard owner, remember to save the prunings for up to year. 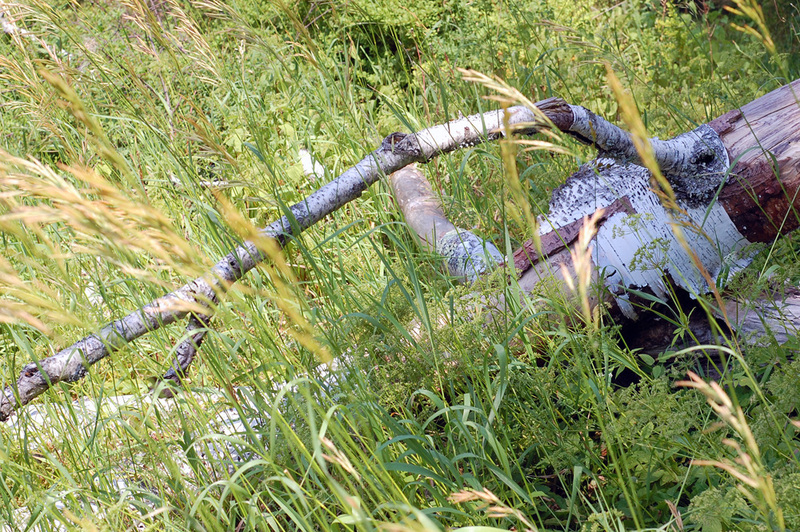 Another method of collection is to simply wait for a windfall and gather fresh fallen branches after a storm has passed. Of course the best way to gather ample quantities of bark is to keep a woodstove. The wood for our stove comes from diseased or damaged trees on the property that need to come down, or occasionally a tree that will be used for furniture making. This gives me heaps of bark that can be dried and saved! 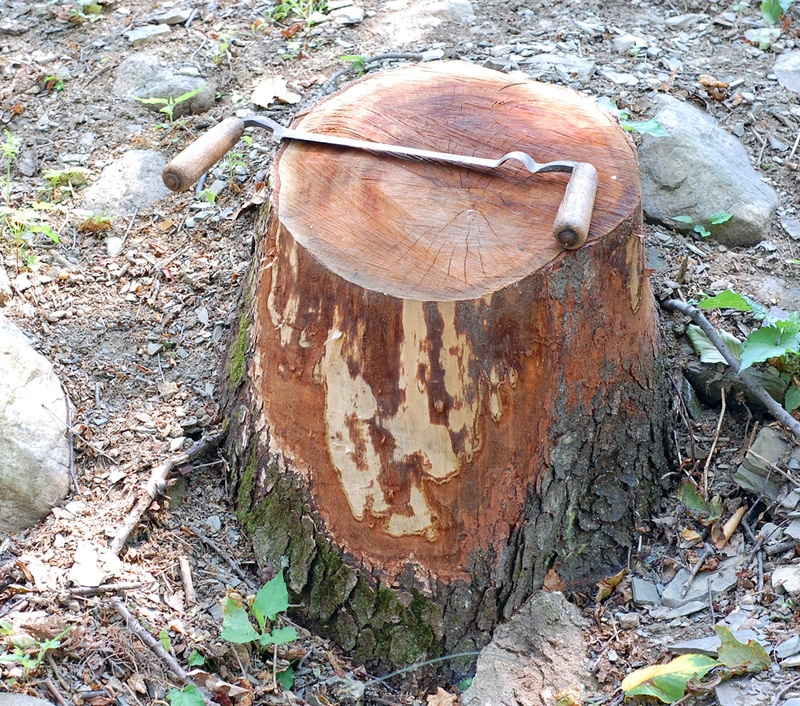 Twigs can be prepared as described above, or swathes of bark can be taken off using something like a spokeshave. Take both the outer bark and the spongier, softer inner bark - that’s where the color is. Pictured above is a spokeshave and its effect on a cherry stump. Anything you are not using immediately can be spread out in a breezy place until thoroughly dry and stored in paper bags for up to a year. Whether you get your bark from pruning, branches, or cordwood, it should be removed from the wood when fresh, then used or dried for future use. After about a month of sitting on the wood, the bark seems to loose its dye potential. You can also discard the craggy outer layer of bark, it’s the inner often brightly color layer that holds the most dye. Another benefit of the woodstove is a place to keep the dye pot simmering for hours during the cold months without using the energy of the kitchen stove. It is also useful for making wood ash lye, a pH control and modifier. Rather than purchase soda ash or ammonia, you can fill a plastic bucket 1/3 with cold wood ashes and top with cold water. Leave it for about a week until the ashes settle out and the liquid feels slimy. Decant the wood ash lye into a glass jar without disturbing the sediment, and it can be kept indefinitely. A 1705 dyer's treatise on right proper lye making and the merits of various ashes can be found here. While I am binding away, it is time to make some room on the bookshelves. A summer sale! And you, my dear readers, have a week before I tell anybody else. Enter the code YARROW during checkout at the Etsy shop for 20% off anything currently in stock. The first step in the natural dye process is gathering plant materials. If you have a garden, there are simply dozens of plants you can collect and dry or freeze throughout the growing season. Some you may have already - coreopsis, marigold, dahlia, or sunflower to name a few. Other less showy plants can be cultivated specifically for dye, such as indigo, weld, madder, or lady's bedstraw. My little garden has a few dye plants in it, but the vast majority of my dye materials are foraged. Some beautiful dye plants are easily recognized by even an amateur naturalist like myself. The primary rule of foraging in the wild is to collect carefully and responsibly, which means gathering about one specimen out of ten. Literally to decimate in the Roman Legionnaire sense, taking one-tenth preserves the health of the wild population. It being a beautiful day, I am venturing out to see what I can find. 1. Birch leaf Birch leaves are easy to spot, but sometimes hard to reach. They give a sunny yellow or chartreuse. 2. Yarrow, Achillea Yarrow is common meadow wildflower which gives yellow and olive shades. Cut close to the base to encourage re-growth. 3. Cherry leaf I've had good success with black cherry leaves producing shades of orange on wool and a lovely golden color on silk. 4. Barberry Barberry, particularly the Japanese and European varieties, is an invasive shrub and thus an ample dye source. Gather all you can of the leaves, barbed shoots, and brightly colored roots for a strong yellow or chartreuse dye. It also makes a good turquoise when overdyed with indigo. Don't bother planting it, there are too many barberry plants in our woodlands already! Each of these plants should be used with a mordant to form a chemical bond with the fiber being dyed. They can also be air dried and stored in paper bags for later use. I am currently amassing a collection of dried materials to keep me supplied during the cold months. Now is the time to be foraging! Look for elderberry leaves, oak leaves, staghorn sumac, willow fronds, Queen Anne's lace, black-eyed Susan, and many others to keep the dye pot brimming through the winter. When working on bookbinding commissions, I do sometimes have requests for fabric colors which are not present in my textile stash. In the past I have offered to custom dye the fabric for the book cloth or binding, but it is difficult to safely carry out this somewhat toxic undertaking in my intermingled studio/living space. And the colors can sadly tend towards the artificial when it's all over with. I am hereby venturing into a new dyeing procedure, possibly the simplest of all. Solar dying is a simple and non-toxic way to give color that is directly related to the plant matter involved and the season it was gleaned. On my fifth trial, I am finding solar dyeing beautifully in tune with my creative process. Muddled plants, alum, distilled water, and a week in the sun are giving my lengths of silk and cotton delicate hues and ethereal patterning. From left to right: tomato and mint leaves, concord grapes, and black walnut hulls on day seven. I've used 1/4 teaspoon alum as a mordant for each pint of water. I've also left the plant matter in the dye bath, which gives a range of tones and delicate pattern of creases to the cloth. For flat color, you can allow the pant matter in the dye to steep for several days, then pass it through a strainer before adding the fabric and returning the concoction to the sun. The album above is bound in homemade book cloth made from black walnut dyed silk. Overlaying the silk is a pleated length of antique crinoline fabric from the same dye bath, slit at the peaks to reveal the darker silk beneath. I'm going to keep on with this solar dyeing, I like it.